academicjobs.net is a global online resource that connects academic job seekers and employers in higher education. Through its unique and innovative website Academic Jobs Today aims to lead and modernize how job seekers and employers find and learn about each other online. For colleges and universities worldwide Academic Jobs Today is the ideal resource and business partner for achieving high-impact recruiting and advertising results. For job seekers, Academic Jobs Today is a must-use resource for staying abreast of job-related news and trends and for finding employment on all levels of higher education. 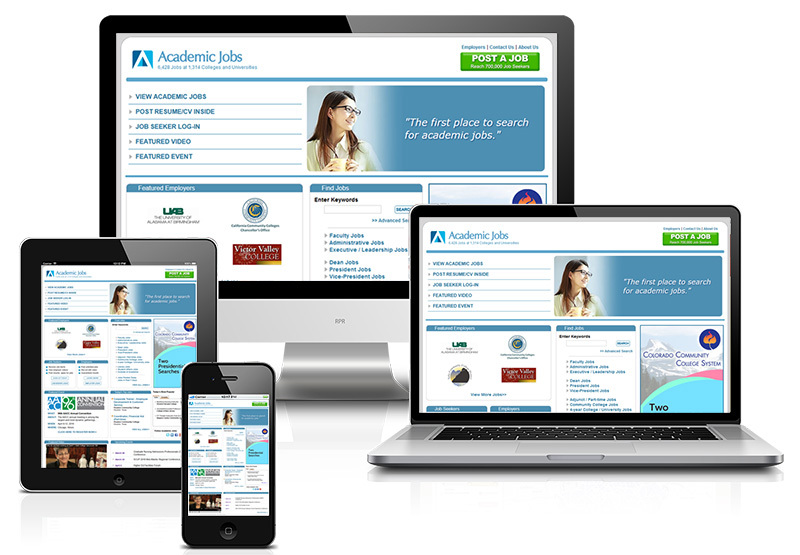 Academic Jobs Today is the first and only higher education employment site to give employers a wide range of online video recruiting tools . The site offers a wide range of video advertising options including Video Institutional Profiles (VIPs), which allow colleges to promote their institutions with video year round, even when they do not have jobs listed. Another Academic Jobs Today video offering - Employer Video Showcase - gives employers prime front-page video space to connect, communicate and reach thousands of prospective job candidates. In another first-in-the-industry offering, Academic Jobs Today features job seekers on its front page every day so recruiters and employers will see some of academe's most highly qualified job candidates before seeing anything else each time they visit Academic Jobs Today. Customer satisfaction is one of the highest priorities at Academic Jobs Today, and the company is the only higher education employment website to guarantee its service and results. All of the one-year job posting subscriptions at Academic Jobs Today are backed by the company's True Service Guarantee . The guarantee states that if employers are not 100 percent satisfied with the level of customer service Academic Jobs Today provides during a twelve-month subscription, Academic Jobs Today will give the employer six months for free on their next annual subscription. Also, if an employer is not completely satisfied with the number of leads and inquiries generated by their year-long subscription, Academic Jobs Today will give the employer six months for free on their next annual subscription. The Academic Jobs Today staff consists of award-winning professionals who have achieved excellence for years at academic institutions and in leading corporations. With more than 70 years of combined experience, the Academic Jobs Today staff has areas of expertise in higher education administration, human resources, university career counseling, and academic journalism.